Few real exchanges of experiences in any social field occur between Belgrade and Pristina. One of the few recent attempts to break the isolation was the aptly named project, Exception, a retrospective of the contemporary art scene in Pristina. The exhibition ran in Novi Sad, but not in Belgrade, where extremist protestors violently obstructed the exhibition opening during Belgrade's "hot" February 2008. Osservatorio met with some of this project's main organisers. They concluded: "cultural racism" prevented the exhibition from opening; artistic media may be the only fora opened for real communication between Pristina and Belgrade; despite the importance of their efforts, the organisers find it difficult to fight against prejudices. They wanted "to be an exception to the dominating prejudices, silences and taboos between Serbs and Albanians. This exhibit should have been our exception to what is happening here. We always talk about borders and territories, but never about people or history," says curator Vida Knezevic, 28 years old, when talking to Osservatorio at Gallery Kontekst, in Belgrade. In February, this gallery could not open the exhibition Exception (in Serbian: Odstupanje), a long-planned retrospective of Pristina contemporary art. Vida's comments are similar to those of Dren Maliqi, 27, one the 11 artists selected for the exhibition. In one of Pristina's many new bars, Dren says, "the problem of the Serbian politicians regarding Kosovo is that they always talk about the territory and never about people." I ask Dren, "When one hears the leading Kosovan Albanian politicians, isn't it mostly the same thing but from the other side?" Dren sums up the issue, "Thaci is a direct product of the Serbian state. If there hadn't been Milosevic, there would be no Thaci." Two years ago, Vida and her colleagues at their small gallery asked themselves: "Have we ever met someone from Pristina? Do we know any artist from Pristina? No!" Today, she still asks "but why not, if it was a part of Serbia at that time?! In 2006, we realized we didn't know anything about the contemporary art scene in Pristina. We were the younger generation, which was not 'conscious' during the 80s and early 90s. We had to do more research about the old 80s." After two field trips to Pristina and 18 months of work, the project Exception was seen in the Contemporary Art Museum in Novi Sad, and was supposed to open in Belgrade on February 7. The exhibitions were supposed to launch a series of other initiatives, such as roundtables both in the Serbia and Vojvodina capitals (together with the Kontekst Gallery, this project was also organised by the Institute of Flexible Cultures and Technologies - Napon, based in Novi Sad). Osservatorio readers may remember how this exception turned into a "rule", even if it drew little attention of foreign media. Some 300 protesters, which the B92 website identified as "members of the Obraz in Serbian: cheek, honour nationalist movement", obstructed the opening of the exhibition at Kontekst. 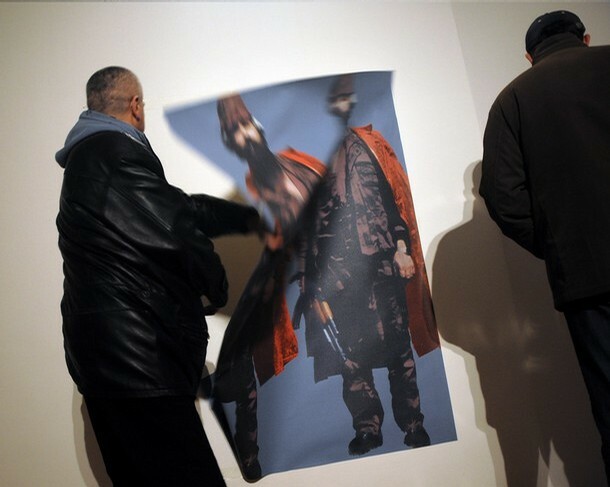 Two protesters partially destroyed the work Face-to-Face where Maliqi printed Warhol's famous image of Elvis Presley with a gun facing the image of Adem Jashari in his military uniform. Jashari is a war hero for virtually all Kosovan Albanians; a terrorist for a certain part of Serbs. The young artist explains that he confronted two icons of two different worlds - the West and Kosovo, a pop star and a war hero - because back in 2003 when Maliqi made this work, "the most powerful icon in Kosovo was exactly Jashari." He acknowledges that "in Belgrade this work could be perceived in a different way and there might be people who would think I was provoking. I was only trying to represent, almost like a journalist, what was happening in my society in contradistinction to Elvis in another society, at another time." However, Face-to-Face was just one of the several works on Exception. Dren himself had another work selected: the projection of the word hope, in white letters, on a white wall... Vida doesn't look like she will let her hope fade away, but she certainly sounds more pessimistic when she states that "after this accident, a certain clero-fascist ideology became very clear." "We were so naïve as to think that the police would protect the opening of the exhibition and guarantee our own safety," says the young curator, also asking, "Why didn't the police suggest opening it another day? How could it happen that the police could not guarantee the safety of such a small gallery? Why were the police so interested to know when we would move the works to another place, when 70% of the works were just DVDs? Why haven't the police replied to our letters asking who destroyed Maliqi's work?" She underlines the police's similar inefficiency on February 21 in front of some foreign embassies, unlike "during the Eurovision Festival when the police did a great job! It is a clear example that they can keep order. There were rumours going round that there might have been attacks on gays and lesbians at the Eurovision nights in Belgrade but fortunately, nothing happened. If the police wanted to, they could have assured the safety of our gallery." And now? "Maybe there is no chance to open the exhibition in Belgrade this year. Maybe... But a few foreign galleries invited us to open the exhibition abroad. We decided not to. Exception was only meant for this context," Vida says. Dramatist and publisher Borka Pavicevic, 61, was the main guest invited to open Exception. In 1997, she hosted at the Centre for Cultural Decontamination, the exhibition Përtej in Albanian: above, over, on the other side, the last retrospective of Kosovo contemporary art presented in Belgrade. Eleven years later, she tells Osservatorio that what happened on the opening of Exception last February was "cultural racism. There is a recycling of a schizophrenic nationalism. Some stereotypes emerge again," says Borka, "and media in general are irresponsible because they contribute to this homogenisation of the speech in 'us and others' creating hate, fear, tension." Artist Dren Maliqi agrees that "even the so-called independent media represent the society in a totally state orientated vision, both in Pristina and Belgrade." Curator Vida Knezevic points out the example of the news around this project, "Media manipulation had started already by the coverage of Exception while it was still in Novi Sad. Probably, that was one of the reasons why this accident happened afterwards in Belgrade. Most media, and also, the Radical Party, misused this exhibition in the presidential election period and on the verge of the independence declaration in Pristina. They pulled Dren's work with Jashari out of the context of the whole retrospective." Vida continues, "We didn't want to do any kind of self-censorship. We worked on this project for 18 months and it was scheduled for January and February 2008, much before the presidential elections or anything else." When we finish the tea in Pristina, Dren observes that he, Vida and Borka (among others) belong to "a very small minority that tries to break an imagined border between the two communities. We break the ice between the artists because at the governmental or media level there is almost no communication, apart from business, especially inside the mafia." Lighting up one more cigarette in her office at Centre for Cultural Decontamination, a map of the Yugoslav Wars on the wall behind her, Borka remembers, "Cultural elites have to communicate in order to decrease the level of hysteria in societies, nowadays like in the 90s. Artists have to be critical of their own states and move something forward." Borka would participate in an art project in Pristina, as she went to Sarajevo, because "the sieges still continue..." she says. Curator Vida says in advance it is not interesting for her "to present Serbian artists as a whole, in Pristina or elsewhere. I don't like this association of an artist that represents a nation." On the "red phone line" between Belgrade and Pristina, not many people talk to each other like Vida, Dren or Borka. They want to be exceptions looking beyond 2008, above the invisible sieges that still overshadow their cities.